Chuba Akpom is no secret, recently tied down to a long term deal in order to evade the affections of Liverpool and Borussia Dortmund, he is the prolific talisman of Arsenal's Youth Academy. Fans will be desperately hoping a succession of unsuccessful loan spells do not derail the confidence and development of the English Youth International. Arsenal have a plethora of young talent in reserve all vying for a chance in the first team, a chance that is far more plausible with Wenger than any other Premier League manager. The problem,is that their isn't enough space for everyone to take that opportunity, this sees a fair few leave on loan to further their development and return with a better chance of progressing. Sometimes the problem with going on loan after loan is you become slightly disassociated with the club and the reintegration can be difficult. This is a logical fear for Akpom considering the path of those before him, take Benik Afobe and Chuks Aneke for instance, blessed with exciting raw ability. Both had successful loan spells, but still could not find the light at the end of the Emirates tunnel. The expression out of sight, out of mind is the worst nightmare of a young footballer. At 19 years of age Akpom has time on his size, he developed early through Arsenal's academy scoring goal after goal for the Under 18s and the developmental side. The striker's pace, power and finishing resemble that of Danny Welbeck. 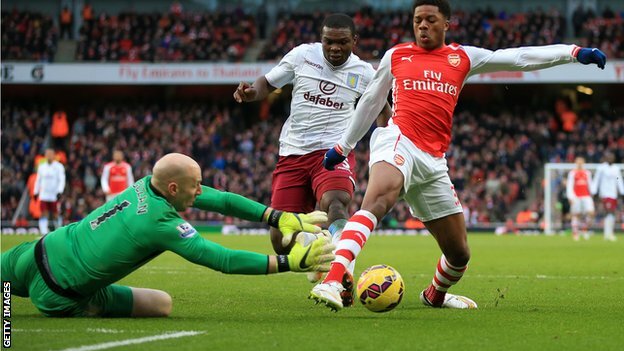 As Akpom grows in his frame he could be an imposing figure that strikes fear into Defenders. Chuba is Wenger's type of players, whilst he possess' all the technical abilities an Arsenal player should he also has a strong work ethic, willing to chase down lost causes and harass the opposition. Joining Arsenal at six years old, Akpom rose through the ranks, signing his profession contract in 2012. His first team debut came as an Injury time substitute against Sunderland in September 2013. Weeks later he stepped up to score in a Capital One Cup, penalty shoot out against West Brom. His most telling contribution in a Gunners shirt came in January 2015 as a second half substitute against Aston Villa, where he almost certainly should have been awarded a penalty in the 5-0 victory. His first stint on Loan came with League One Club, Brentford, making four appearances, the intention was to aid the transition for Under 21s Football to Men's Football. The next spell came at Coventry City, Akpom failed to impress again, but in hindsight, given the off field issues around the Sky Blues this was maybe not the best environment to develop. His latest loan was a more suitable choice, a step up to the Championship with Nottingham Forest. This time round, he would be playing at a big club with expectations. Despite some good performances Akpom failed to score again, struggling against some of the Division's more aggressive defenders. It's difficult to judge where the place is for Chuba Akpom, he will no doubt have learned things from his spells, but it is difficult not to worry about him getting lost in the abyss of Arsenal loanees. One thing is for certain is Wenger is very invested in the Englishman's development. Forest Boss Dougie Freedman gave Arsenal a lot of credit for accepting a smaller wage contribution from them then they would have got from Norwich, Wenger saw the City Ground as a fostering environment for Akpom, Freedman also appears keen to see Chuba return for another run in Nottingham. Where Akpom goes Wenger will decide, but our hope is that Akpom is given the chance to fulfil his potential, the opportunity that was not afforded to likes of Benik Afobe. Jay Emmanuel Thomas and Chuks Aneke. A great English striker is something Wenger has never produced before, but now finally may be that time.